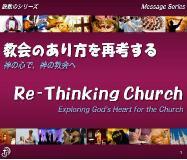 In September 2011, Michael started a new message series at Sakai International Bible Church called "Re-Thinking Church: Exploring God's Heart for the Church." For the next 9 months we took a fresh look at God's heart for SIBC as revealed in the pages of the New Testament. Little did we know when we started this series that Jesus was going to use these teachings to lead the church on an exciting, new adventure. By the time the series ended in July 2012, we sensed that the Lord wanted us to leave our rented facility and begin the transition to a more simple-style church in the home of a church member. Since then, SIBC has changed it's name to Oasis Church. Please listen as we explore God's heart for the church. Part 2: What Is Church? Part 5: Who Is Your Leader?